On tap at Maine-ly Meat in Bar Harbor, ME. This one pours a very dark brown, nearly black, with a white head, and a little bit of lacing. Smells like roasty coffee, bitter dark chocolate, barley malt, and a little bit of lactose. This is a solid straightforward coffee milk stout that hits all of the expected flavor points. Roasty coffee and black roasted malt, dark chocolate and sweet creamy lactose. It's nice. This is creamy and soft tasting, with a good level of carbonation. A solid no frills coffee stout that hit all he right notes for me. 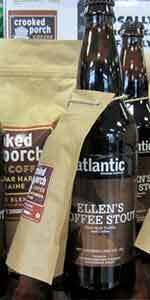 I had the pleasure of sampling this beer at the Bar Harbor Brewing retail storefront in Bar Harbor, Maine. While it's not on the regular tasting menu, the associate was kind enough to give me a chance to try it. Poured from 750ml into snifter. Let stand for 15 minutes to warm slightly and bring out the flavors. A: Dark dark brown. Creamy scant head. S: chocolate, vanilla, coffee and black licorice. T: chocolate up front with strong coffee on the back end. Hints of vanilla. M: full and slightly carbonated. O: coffee flavor is nicely balanced with vanilla. This is easily the most "coffee" coffee stout I've ever had. Not the first beer I'd reach for but still pleasant when I'm in the mood for a true "coffee" stout. Purchased at the brewery. Poured into a willy glass. Looks a bit like dark, black coffee...clear and slightly translucent, but too dark to let light through except at the edge, with a two finger, creamy, foamy head. Aroma is more coffee than roast. Taste is somewhat sweet, with coffee and maple syrup on the front and just enough bitterness to balance it out. Mouth feel is appropriate for the ABV...silky, medium-bodied, not thick or chewy like some might prefer. Overall, the best of the Atlantic beers that I tried and one of the better 'light' stouts I've had.